Shopping for your first skateboard can be a bit intimidating, especially if you’re a beginner or if you are buying it for someone else. It can definitely be a headache. So with that in mind, I’ve made a list of the best complete skateboards for beginners and put a guide to help you pick one. After reading it, you’ll know how to sort the wheat from the chaff and you can identify a quality board. Starting off our list, we have the CCS skateboard. It’s made by the California Cheap Skates brand (CCS) who have over 30 years of experience in the industry. The complete itself is pretty basic and uses little to no branding on its components. It features a ‘popsicle’ deck that simply has black grip tape on top, with no graphic on the bottom. The wheels are 52mm in size and 100a hard. This means they are appropriate for use in skateparks but won’t feel so good when skating on asphalt and in the street. The trucks themselves are fairly standard at 139mm in size. Finally, the complete comes with a few options to choose from. From a 7in mini kids option to a large 8.5in option for people and for adults with bigger feet. You can pick what’s most appropriate for you. Click here to take a good look at it on Amazon.com. Though it is pretty basic, the setup is fairly good quality. It’s a cheap and simple option that will work well if you’re on a budget. That said, it is pretty bare and may not work for all tastes. Check out the Powell Golden Dragon below for a cheaper graphic’d option. With their roots in San Diego, California, this skate brand started in 1993 and have been producing quality decks since. The complete skateboard comes in at 7.625in in width, making it perfect for people with smaller feet or kids in general. The deck itself is made from Canadian maple, ensuring its strength and rigidity against the abuse of doing tricks and riding. This deck will last a long time. Beneath the deck, you have heavy duty aluminum core trucks. These trucks are lightweight and have grade 8 steel kingpins and axles. This basically means they will be fairly strong and durable and won’t break easily. The complete comes with 52mm 99a wheels. These wheels are slightly softer making them easier to use on the street, but they are primarily suited for use in a park. Finally, you have smooth-rolling ABEC 5 bearings in the wheels. These bearings will keep you rolling and they even have a rubber shield for easy maintenance. Find out its pricing and more on Amazon.com. Altogether, this complete is high quality and comes at a decent price. It will work well if you prefer the narrow 7.625 width, in fact, I think it’s the best skateboard for 7- 8-year-old beginner. However, the width isn’t right for most beginners, if you don’t have small feet, I recommend you have to look at the Baker complete below. Powell Golden Dragon is a brand working under Skateone & Powell Peralta to produce cheap, quality skateboards. Being a child of the biggest names in skating, you know their completes won’t disappoint. The complete is a very affordable, but a high-quality option for beginners. It comes with really basic gear that functions well and looks badass. The dragon graphic below looks fierce and leaves a lasting image. The deck comes in at 7.625in in width and 31.625in in length. This makes it perfect for people with small feet or for kids in general. That said, people with bigger feet will struggle to learn on the deck. The trucks consist of your basic cast aluminum, with a carbon steel axes and kingpin. The truck has no logos and doesn’t have the best finish – all in the name of cost saving. It will work just as good as other trucks but won’t look as good. Check out this deck and take a look at it’s cost here on Amazon.com. Being manufactured in China allows the deck to be priced low, but buying it hurts the skate industry and American economy. Whilst homegrown products are more expensive, they support the local economy. So in a way, this is one of the ‘worst’ skateboards you can buy. Check out the Element below for ‘homegrown’ product. 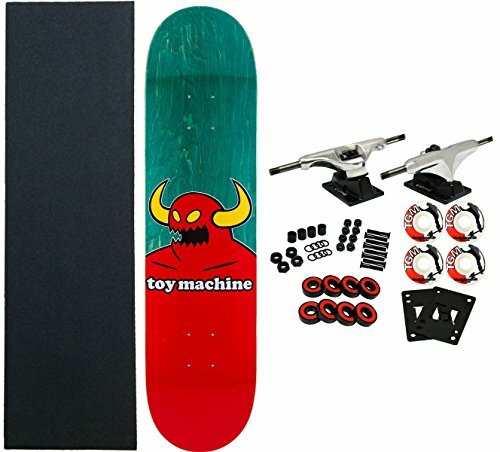 The deck in this complete is from Element but the rest of the parts are put together by TGM skateboards – a common trend you’ll see with some completes. The deck itself is fairly high quality coming in at 7.75in in width and 31.5in in length. It’s made from hard-maple, all 100% grown in the USA. Maple is the best wood for making decks given how lightweight and strong it is. You only need a few plys to make a high-quality skateboard deck. Finally, buying this deck also supports the US economy and skate industry. Making skateboarding more sustainable all around. The trucks are your basic aluminum cast trucks, featuring the standard grade 8 steel kingpin and axles. However, these trucks feature a superior finish to the other trucks on my list and look much better. They perform just as well though. The wheels are your generic skate wheels, 52mm in height and 99a in hardness. The hardness allows them to be both used in the street and in the park, but skating on roads won’t feel the best. Find out more about this board on Amazon.com. 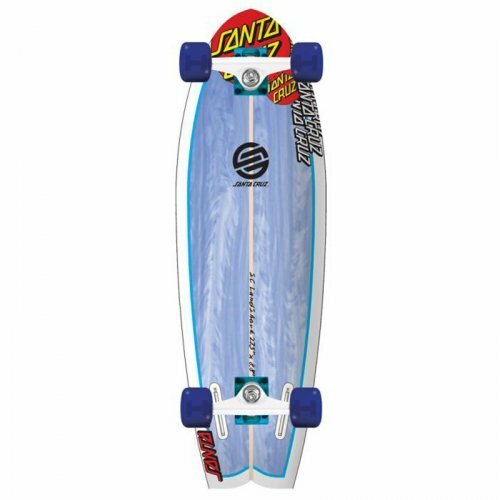 The first longboard on my list. This board is made by one of the best longboard brands on the market – Loaded Longboards. 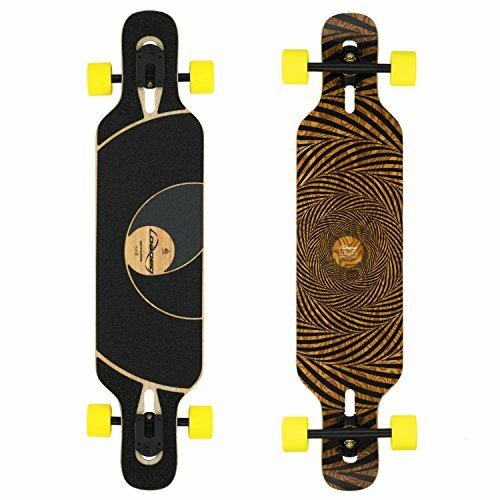 The Tan Tien is a premium longboard and it doesn’t compromise on quality. It’s built with cruising and carving in mind and all its features are suited for such. The deck is made from a bamboo and fiberglass hybrid, keeping it lightweight and bouncy. The bounciness helps absorb road vibration and helps produce a smooth ride. It also makes the board a lot of fun to ride. The deck also has a ‘drop through’ mounting. Lowering its center of gravity and making it more stable and easier to push and stop on it. Lastly, the trucks and wheels used are from premium brands Paris & Orangatang. The trucks are designed to turn really smoothly but to remain stable as you gain speed. Whilst the wheels are larger at 70mm but aim to provide a smooth ride and roll over pebbles really easily. Check the longboard on Amazon.com and find out more about its features. As with everything high quality, this longboard is pricey. It simply won’t fit some budgets but is worth the sacrifice if you can squeeze it into yours. It will make your skating experience more enjoyable. Based in the USA. Globe is a brand that specializes in producing both skate and surfboards. By dipping their feet in both industries, they’ve gained expertise in recreating that surfy feeling on cruisers. This board comes in at 33in in length and 9.7in in width. This makes it just as long as a traditional skateboard but much wider. The extra width means it will be super comfortable to skate and to cruise on for all types of feet. The deck is made from 7plys of hard rock maple and features a cool looking galaxy graphic on the top and bottom. The graphic is printed on the grip tape, so avoiding stepping in mud if you don’t want to dirtify that sick print. Finally, the board comes with 150mm slant trucks and 62mm tall wheels. The tall wheels will ensure a smooth ride and will soak up a lot of the road vibration you encounter. 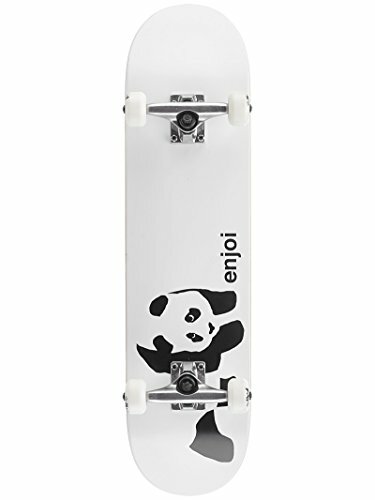 The board is more expensive than the other skateboards on my list but is suited for a different purpose – cruising. If you’re not interested in doing tricks, this board is for you. Find out more about it on Amazon.com. Another core skater brand. enjoi’s primary goal as a company is to enjoy life to the fullest and their marketing & boards reflect that. This complete is similarly set up to the Element skateboard above. It features a deck from enjoi but the rest of the parts are supplied by TGM skateboards. The deck is 7.75in wide and features the ‘resin 7 construction’. It has your basic 7 plys of Canadian maple but uses a specialized epoxy resin glue. The glue helps the deck last longer as it sticks really well to each individual ply and hardens, unlike normal glue. The trucks and wheels are the same as those on the Element complete. The trucks have a good finish and will work well for all beginners. The wheels are 52mm, 99a hard and will work well for both park and street skating. Inside the wheels are Amphetamine bearings. These are your basic ABEC 5 bearings but they come with rubber shields. The shields allow for easy maintenance, so you’re able to elongate their life through cleaning and using in lubricant. The deck is a good alternative option to the Element complete but is basically the same. It also comes disassembled so you might need a skate tool to put it together. The Penny Nickel is the bigger brother of the smaller Penny. It comes in at 27in in length and 7.5in in width. Making it suitable for kids and people with small feet. That said, if you aren’t skating long distances, a cruiser this size is more than ok. The deck is made of plastic basically making it indestructible. It is really resistant to wear, tear, impacts, and you don’t have to worry about it getting wet or delaminating … perfect for some kids. It comes with tiny 6in wide trucks and 60mm tall, 78a soft wheels. The trucks will allow you to make tight turns with ease, whilst the soft wheels will absorb a lot of road vibration. Check out this cruiser on Amazon to see all the option available. The Nickel is easy to ride and especially recommended to beginners. Though it’s narrow width means it won’t ride comfortably for longer periods. I personally think it’s the worst ‘skateboard’ you can get. Being plastic, they don’t feel like real boards and don’t offer an authentic skate experience. Check out the Globe Galaxy cruiser above for something more comfortable. Baker Skateboards have been around since 1999. They grew in popularity because of their goal to keep it pure and simple. Their skate decks are a reflection of this. The widest skateboard on my list at 8.25in. This board is perfect for adults and for kids with bigger feet. It will be more comfortable to skate and easier to learn on for them. The deck has a black diamond grip tape above and features the minimalist Baker graphic on the bottom. Not the most artistic but it keeps things simple. Like the Element and enjoi boards above, this complete features the core trucks and the basic wheels from TGM. 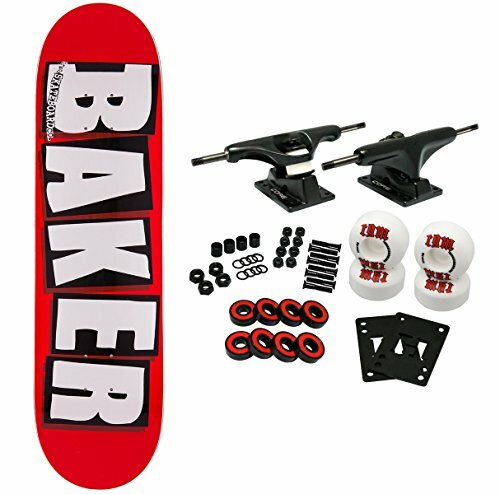 The trucks and wheels are excellent options for your entry level skater. They turn, roll smoothly and don’t make balancing too hard of a task. They are also affordable and will fit in most budgets. Find out more about this board on Amazon.com. The width of this deck makes it suitable for larger, older kids, as well as adults. That said, kids with smaller feet may struggle to learn on it as it will be hard to do flip tricks because of the width. For a similar, but a narrower option, check out the Element or enjoi completes above. Another Toy Machine deck. This one is also fulfilled by TGM skateboards and features the Core trucks, TGM wheels and Amphetamine bearings. It is very similar to the Baker, enjoi, and Element completes above, but the deck comes at a width of 8.125in and has very mellow concave. Concave is basically when the deck is curved inwards, sort of like a circle. Most skateboards have mellow concave and some might have it more curved than others. The mellow concave and wide deck will be very comfortable and make it easy to skate. The mellow cave means the foot can rest flatter and therefore relax on the deck. The wide deck makes it easier to balance on the trucks. This deck is perfect for beginners with bigger feet and people who want the most comfortable skating experience. Find out more about this board here on Amazon.com. The above said the deck comes unassembled. If you don’t have tools at home, you’ll need to buy a skate tool to put it together. Check out the Powell Dragon if you want your board preassembled. Coming in hot from California, we have Santa Cruz’s offering. Santa Cruz is a brand based in California. They specialize in skating but also make pretty good cruiser boards and a few great longboards. The Youth Land is a pintail shaped cruiser. It comes in at 27.6in in length and 9in in width and is made with 7plys of maple. The width makes it really comfortable to skate, whilst the short height means it will be easy to store and carry around. The deck comes with a spray on grip tape, allowing the white surf-inspired design to show through. This makes the cruiser look like a mini surfboard and it even has color coordinated wheels and trucks to match. The trucks come in white, whilst the wheels are blue. The trucks are 137mm in width and produce a really carvey turn. This might be too much for beginners but you can tighten them down for more stability and less turn. The wheels are 65mm tall and 78a soft. This means they will absorb a lot of road vibration and produce a really smooth ride. Finally, the board is reasonably priced and would fit most budgets. I especially recommend it to beginners and especially if money is tight. Find out more about this board here on Amazon.com. How to pick the best skateboard for a beginner? It’s easy enough for me to suggest some boards to you and call it a day. However, it’s more effective if you have some underlying knowledge and can identify a good board, yourself. Gain some knowledge below. What types of skateboards are out there? As you’ve noticed from the list, there are a variety of different types of skateboards out there. They come in different shapes and may sometimes have different purposes. These decks are what you’ll most likely encounter at the skate park, they are primarily designed for doing tricks, popping ollies etc. They are easily identifiable because they come in a ‘popsicle shape’ with two kicktails and are generally symmetrically cut out. A good example of this board is the enjoi complete. They are best used for street, park, pool and transition skating. If a kid asks for a skateboard, you can’t go wrong if you get them a street deck. These are generally the small plastic cruiser boards. They are easily identifiable because they are normally plastic and feature only one kicktail. They are designed with cruising, easy storage, and durability in mind. A good example of this is the Penny Nickel. They make excellent boards for kids but are generally harder to skate if you have bigger feet. Borrowing the general shape from the street boards above, these boards are designed for cruising and comfort in mind. You’ll encounter a variety of shapes and sizes with them. A common shape is a wide board with a single kicktail. Eg. The Santa Cruz Youth Land. Cruiser skateboards are great for beginners because they are really easy and comfortable to skate. They have great turning and are best used for casual cruising. They are also good for commuting and getting around. They are suited for both adults and kids. These boards are easily identifiable because they are large (35in+) and wide. They are designed to be very easy to skate, super stable and to be really comfortable. Eg. 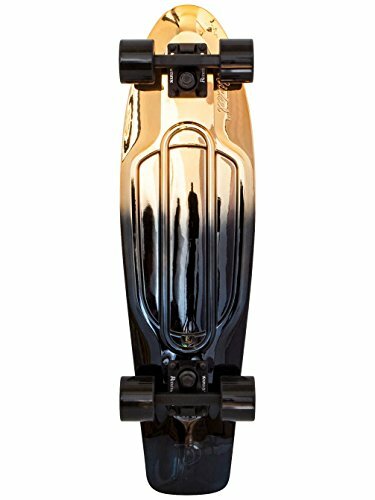 The Loaded Tan Tien, check it out on Amazon here. These are really great for cruising but are generally larger and therefore more cumbersome to store (and carry) than cruisers. There are different types of longboards, but the most common you will encounter will be your basic cruiser. What are the skateboard components? The deck – This is the piece of wood (or plastic) you stand on. As you’ve seen above, they come in a variety of shapes and sizes. The trucks – These dictate how the board turns and how stable it will be. You can typically tighten and loosen them for more stability or more turn respectively. The wheels – These allow your board to roll and have different properties for different purposes. Cruiser boards have bigger, softer wheels (78a-93a) that provide smooth rolling and can handle actual roads. Skateboards have harder (97a-100a), smaller wheels that are best suited for fast rolling in the skate park. They don’t roll smoothly on actual roads and can get caught on pebbles easily. The bearings – These go inside your wheel and allow it to roll. They dictate how fast they can roll. You’ll encounter different types, but they all basically do the same thing. Helmet – This should be a no brainer, especially if you’re a beginner. Whilst it’s unlikely you’ll injure your head, it only needs to happen once to cause a lot of damage. Better safe and simply get one. Check out my list of recommended skateboard helmets. Pads – As you go about learning tricks, or even simply cruising. You will eventually find yourself falling – it’s unavoidable. Whilst some people don’t mind a few dings and bruises here and there, those things are painful. It’s better you protect yourself with some skate knee pads, elbow pads and maybe hip pads to soften those falls. Skate tools – These are handy tools you can use to take apart, tighten and loosen your skateboard. They are useful to have on hand in case a nut comes loose or if you want to tighten your trucks. The worst thing you can get for a beginner is simply a board that doesn’t match up with what they want. Nothing will make them want to skate less than that, in fact they may not skate at all! Simply put, don’t get your kids a skateboard if they just want to cruiser board for cruising around. Vice versa if they want to do tricks and spend loads of time at the skatepark. You also want to avoid cheap longboards all together. Whilst they are affordable, they are usually cheaply built and use poor quality parts. They don’t ride well at all. 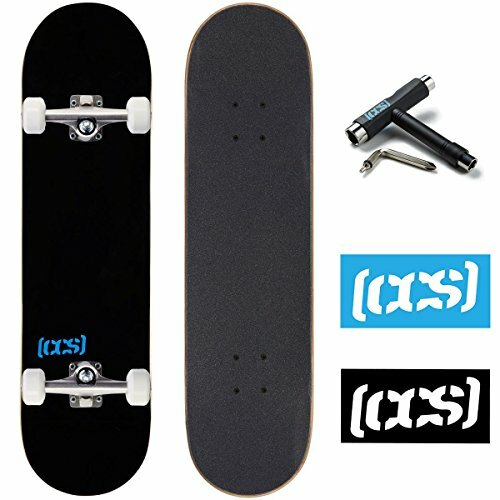 This will provide a poor riding experience for a beginner and won’t make skating all that enjoyable. It will feel more like a chore than something they should enjoy. Finally, don’t get them a downhill longboard. These boards are designed to be stiff and stable. So they don’t feel good at all at slower speeds. Which board caught your eye? It’s easy to spend a lot of time researching the perfect board and get so caught up that you don’t end up getting one for a long time. You definitely want to avoid this. It’s best to simply bite the bullet and get the skateboard that looks best to you and your needs. As much knowledge as there is out there, the experience will always be the best teacher.